"Kumaragupta I. Circa 414-455 AD. AV Dinar (20mm, 8.21 g, 12h). Horseman type. Kumaragupta, not nimbate, holding bow and sword, riding prancing horse to left / The goddess Lakshmi, not nimbate, seated left on draped stool, holding a lotus and feeding grapes to a peacock; five point tamgha to left, "Ajitamahendra" in Brahmi script to right." 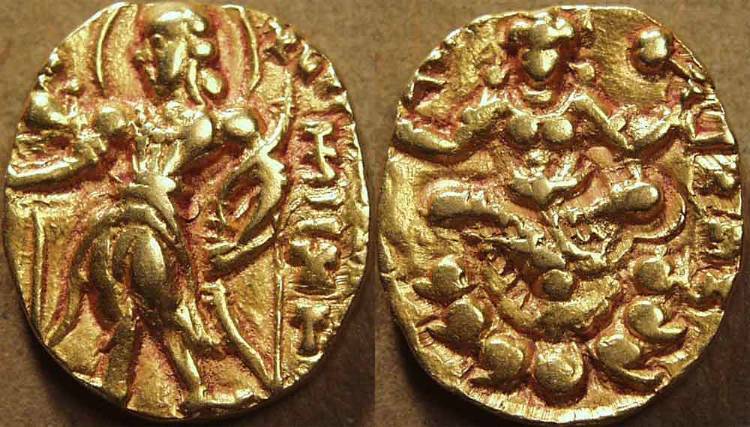 "Kumaragupta I Gold dinar, Archer type with bowstring out. 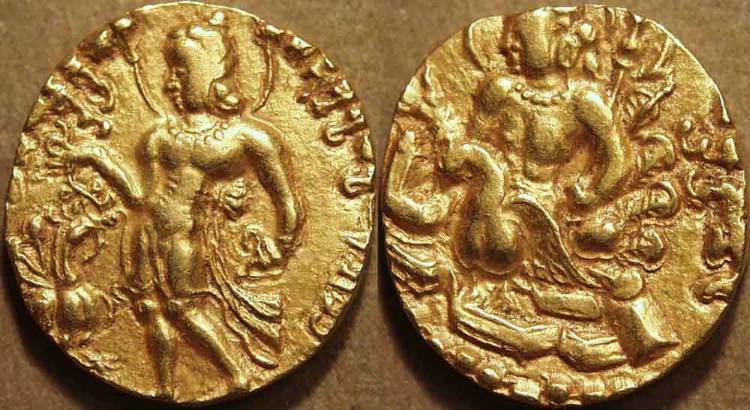 Obverse: King standing facing, face turned left, holding arrow in right hand, bow in left hand, with bowstring facing out, Garuda standard at left, Brahmi legend at right: Kumara. 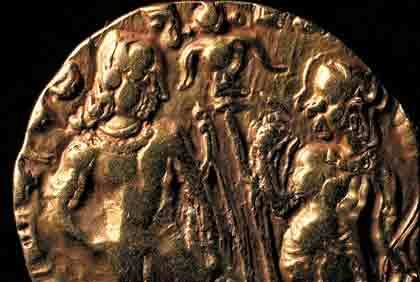 Reverse: Lakshmi seated on lotus facing, holding diadem and lotus, tamgha left, Brahmi legend right: Sri Mahendra. Date c. 415-455 CE. Weight 7.79 gm. Diameter 17-19 mm." "KUMARAGUPTA I: Gold dinar. Obverse King standing left, nimbate, feeding peacock at left, Brahmi legend around: Jayati svagunair gunaravindah Sri Mahendrakumara. Reverse Kartikeya seated three-quarters left on a peacock (his vahana, or vehicle), Brahmi legend right: Mahendrakumara. Date c. 415-455 CE. Weight 8.19 gm. Diameter 17-19 mm." 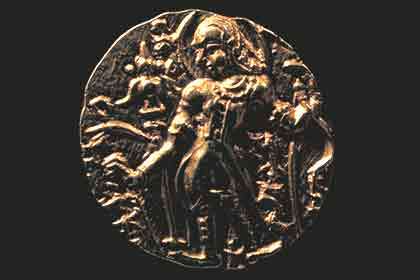 "Narasimhagupta I. Circa 414-455 AD. AV Dinar (20mm, 9.57 g, 12h). Archer type. Narasimhagupta, nimbate, standing left, holding arrow and bow; to left, Garuda standard behind; "Gre" in Sanskrit between feet, "Nara" to inner right / The goddess Lakshmi, nimbate, seated facing on lotus, holding diadem and lotus; tamgha to left; "Valaditya" in Sanskrit to right." 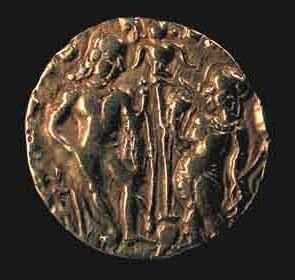 "Gupta Empire, Skandagupta. AR Drachm, AD 455-480. Obverse No legend. Bust of king right. Reverse Brahmi legend. Sri Skandagupta Kramaditya. Altar." "King standing in centre, wearing dhoti none of the usual jewelry, hair tied top of his head. King stands in tribhanga stance, left hand rests on a bow and the right hand grasps an arrow. A garuda dhvaja is behind his right arm. His name Skanda appears between the bow string and his left leg. 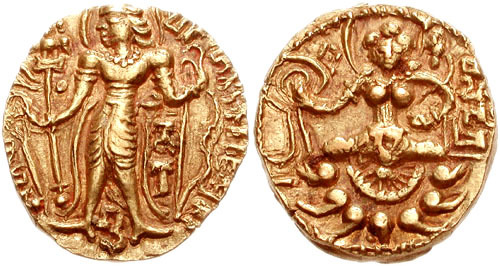 Skanda gupta, Gold dinar, Ca.455-480. The Skanhe Collection, University of Michigan." "To left, King standing facing right, wearing waist cloth and jewelry, holding bow in left hand, arrow in right hand. In centre, a Garuda-dhvaja. To right, Lakshmi standing facing left, holding lotus and diadem, Skandagupta, gold dinar, Ca.455-480, The Skanhe Collection, ACSAA." "SKANDAGUPTA: Gold suvarna. Archer type. 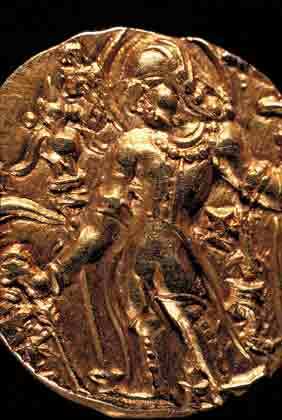 Obverse King standing facing, face turned left, holding arrow in right hand, bow in left, Garuda standard at left, Brahmi legend under arm: Skanda. Traces of cirular legend. 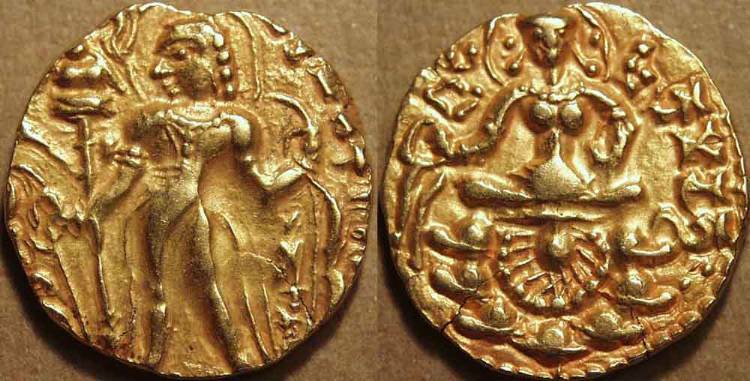 Reverse Lakshmi seated facing on lotus, holding diadem and lotus, tamgha left, Brahmi legend right: Kramaditya. Date c. 455-480 CE. Weight 9.18 gm. Diameter 21 mm."